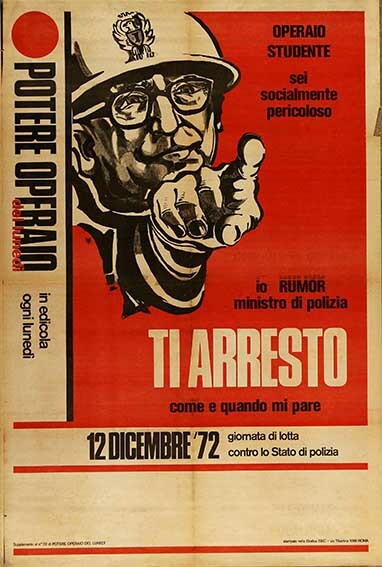 In the aftermath of the Third Congress of the organization held by Potere Operaio in Rome between the 24th and the 26th of September 1971 in which the the thesis on the actuality of proletarian insurrection prevails, the organization decides to promote the formation of a structure for illegal work. Over the course of 1971, this structure-an armed wing-but in any case subordinated to the political leadership of the organization carries out tasks of espionage, armament, training, and “armed support” to mass demonstrations. The illegal work structure develops a presence in Lazio, Piedmont, Tuscany, Veneto and Lombardy. Some arrests following clashes on the second anniversary of the Piazza Fontana bombing induce Potere Operaio to reconsider its approach to illegal work and define a new conception of the clandestine level of the organization with a greater margin of politico-military autonomy. Thus at the beginning of 1972, the Revolutionary Worker’s Armed Front (FARO) is formed. The general strategy remains anchored in the insurrectionist orientation, however there is greater clarification of the discontinuity between legal work and the organization of illegal activity. After these actions FARO ceases to exist.